Experience the best way to discover and explore the lovely and hilly South of the Netherlands: Valkenburg in the province of Limburg. This fully renovated apartment in the city centre of the charming spa town Valkenburg will offer you a pleasant stay. 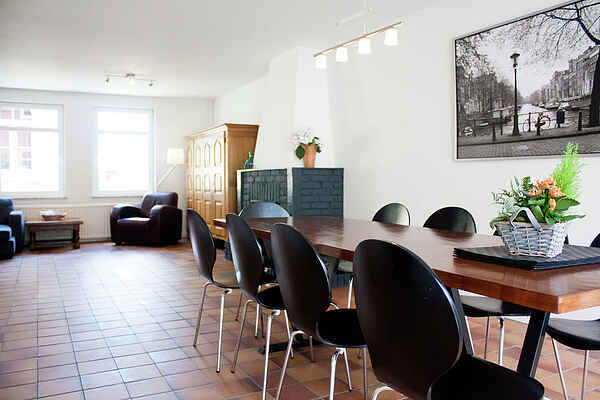 The comfortable city apartment is the starting point for your discovery trips to historic cities like Maastricht, Liège, Aachen, Koln and Brussels, all reachable within 45 minutes. Or you choose to leave your cars and bikes in our safe garage and explore the city centre of Valkenburg which is just a minute away. The town has been receiving tourists for nearly two centuries and is the host of the oldest tourist information office in The Netherlands. Here you can find exciting sights like the caves, with beautiful Christmas markets during winter, the old castle ruins from the Middle Ages and theme parks suitable for children. Other than that, possibilities for relaxation are just around the corner. Visit the spa Thermae 2000 with its warm water springs, which is just 500m away from the house. The hilly landscape of Southern Limburg makes it a lovely as well as a world famous area for hiking and biking trips. We are happy to welcome the Bicycle World Championships for the fifth time, in 2012 in Valkenburg! Come to Valkenburg to relax and enjoy the beautiful environment and its rich culture.